It was 100 years ago that Dr. Élie Metchnikoff noticed that in cultures where people ate fermented foods, they aged better. Metchnikoff, a Russian-born microbiologist and zoologist known as the “Father of Natural Immunity,” put his observation to the test.1 With this simple practice, and based on his research, Dr. Metchnikoff regularly ate fermented foods and lived into his seventies, which, in those times, was a very long life. Some signs of mineral deficiency include dry skin, fatigue, constipation, and gray hair. If you have premature gray hair, your body may need more humic minerals, found in Body Ecology's Ancient Earth Minerals, to help reduce or reverse visible signs of age. For gray hair reversal, the addition of humic minerals are essential since many people are deficient in them since they are unfortunately no longer in some of the foods we eat. Also a Nobel prize winner, Dr. Metchnikoff was one of the first scientists to discover and reap the benefits of eating fermented foods. For a short time, Dr. Metchnikoff's probiotic "theory" -- that good bugs could improve health and keep the mind sharp with age -- stayed at the forefront.2 But it wasn't until the mid-1990s that a fervor for all things fermented returned to the scientific community. I personally feel like the way I eat, with fermented foods having been a staple of my diet for more than 25 years, has had much to do with me being almost 70 years old and having plenty of energy. I’m still flexible. My hair hasn’t turned gray. These are some of the clear signs to me that I’m not aging as other people my age have aged, and I don’t think aging is inevitable. Most of us are aging sooner than we need to be, and it often starts with that first premature gray. 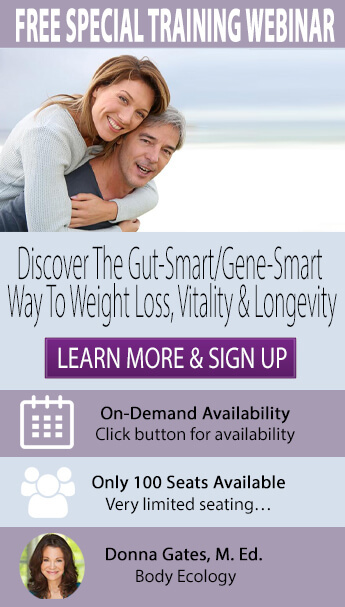 Below, I’ll discuss exactly how to address this pesky problem with natural healthy-gut remedies that can be used to improve your health and your appearance -- essentially turning back time. “I get this a lot: ‘Wow, whatever you are doing, it's working. You look twenty years younger!’ - Angela. To read more about transforming your health on The Body Ecology Diet, click here. 1. Get more humic minerals. Minerals are a catch-all solution for many, if not all, of the symptoms of aging in our bodies. A deficiency in minerals may be the reason we start to get tired all the time, mistakenly attributing this decline in function to age. Minerals nourish the adrenals, and the adrenals provide the body with energy to heal. Signs of so-called premature aging, like constipation, fatigue, dry skin, and gray hair, may actually be a depletion in our prenatal jing, the constitutional energy we are born with. It's possible to replenish prenatal jing by nourishing the adrenals and thyroid with healing foods on The Body Ecology Diet and with ample amounts of minerals. Taking high-quality humic minerals can nourish, detoxify, and reduce signs of aging in the body. 2. Focus on proper digestion + diet. Our bodies need more help from digestive enzymes with each passing year as our naturally-produced enzymes that help us break down and process food deplete with age. So by adding in the right digestive enzymes to help promote and protect a healthy microbiome, protecting yourself from mineral deficiencies (which many are deficient in without knowing - ie. gray hair) and choosing a diet that supports simple principles of proper eating and food combining to rebalance your internal ecology, your body gets what it needs from the inside out. Including the catalase enzyme can also help to bind to hydrogen peroxide in the body, turning it into CO2 and water. While some hydrogen peroxide in the body is necessary -- required by the thyroid gland to make thyroid hormone -- European researchers confirmed in 2013 that gray hair is caused by oxidative stress created when too much hydrogen peroxide accumulates at the root of the hair follicle.4 Flushing out this buildup of hydrogen peroxide with a catalase enzyme can help to prevent hair from bleaching itself from the inside and prematurely turning gray. For gray hair reversal, peroxide-blocking catalase enzymes are better taken internally. Fo-Ti root (He Shou Wu), a member of the buckwheat family, is an anti-aging herb renowned for its fertility-boosting and hair-color restoration potential. The herbal adaptogen has been used for centuries in Chinese medicine, with sedative, anti-inflammatory, hypotensive, cardiotonic, and antitumor applications confirmed in our modern research. For cases of gray hair and balding, taking Fo-Ti root can prove powerful. When researchers gave Fo-Ti root, administered as P. multiflorum extract, to mice in 2015, it was shown to completely reverse hair graying caused by high levels of hydrogen peroxide.5 Fo-Ti root can be taken orally to support gray hair renewal, while also reaping its liver tonic, cognitive, longevity, and energizing benefits. 5. Always eat fermented foods. It’s a new way of living. You can find a quick Body Ecology Diet overview here. 1. Eating too much meat. High hydrogen peroxide levels, a.k.a. the internal hair-whitening agent, are common when eating excess meat. In 2017, gray hair was also linked to a higher heart disease risk in men.7 Though unrelated to the gray hair findings, we know that a diet rich in processed red meat can increase the risk of heart disease and death.8 Meat can still be a healthy part of The Body Ecology Diet, as long as it is unprocessed, properly combined, and makes up only 20 percent of a meal. Many times, loss of hair volume, color, and quality can be caused by a systemic infection, like underlying candida overgrowth in the gut. Countless people in the Body Ecology community have found that by eliminating all sources of refined sugar to control candida, while nourishing the thyroid and balancing hormones on The Body Ecology Diet, hair becomes longer, thicker, and more vibrant. 3. Skipping the (fermented) vegetables. 4. Not getting enough sleep. Stress, sleep, and signs of aging all go hand-in-hand. I personally live by the rule of going to bed at 10 p.m., taking care to dim the lights and turn off my computer to prevent stimulation at least two hours before bed. Getting this deep and restorative sleep may be enough to work as the "fountain of youth" as we grow older, University of California, Berkeley, researchers said in 2017. When examining restless sleep habits in the elderly, UC Berkeley scientists stated that almost every age-related disease has a causal link to our sleep.10 If sleeping for a full 7 to 9 hours proves difficult, napping during the day can fill the gap, protecting the brain and the body from the internal damage caused by lack of sleep. Take back control of your health without leaving your couch. Visit Body Ecology University to view our collection of online courses. Everybody ages, and eventually, we will all have our last day on this earth, but I am absolutely convinced that we can go right on living comfortably in these bodies if we take good care of them. What's on the horizon for new scientific breakthroughs that can change how we age? University of Texas Southwestern Medical Center researchers just discovered, by happenstance when studying tumors, how deleting the SCF gene could cause hair to turn gray.11 Soon enough, scientists may be able to use this information to develop a topical product that supplies us with the gene needed to keep our hair colorful. Until then, we can continue to use all we have learned about our unique genetic blueprints and how they may affect our predisposition for aging and disease. With the gut-smart, gene-smart approach found in The Body Ecology Diet, we can influence our genetic factors -- even a vulnerability to aging -- by the food and lifestyle choices we make. Increase humic mineral intake to prevent a deficiency. Mineral deficiency may be reflected as a depletion in our constitutional energy with symptoms like fatigue, constipation, dry skin, and gray hair. Focus on proper digestion and diet. The right digestive enzymes, minerals and diet go hand in hand with reducing the effects of aging. Catalase enzymes can also help bind to and break down excess hydrogen peroxide that accumulates at the root of the follicle causing hair to turn gray. Restore gray hair with anti-aging herbs. The Fo-Ti root has been used as an anti-aging remedy for centuries in Traditional Chinese Medicine and has been shown to reverse gray hair in animal studies. Eat fermented foods daily. Cultivating a healthy gut filled with good bacteria by eating cultured foods may help to slow down the aging process. Eat too much meat. Excess meat consumption can increase hydrogen peroxide levels in the body, which accumulate to turn hair white and gray. Eat too much sugar. Refined sugar feeds candida overgrowth in the gut; systemic candida infection is often associated with a loss of hair color, volume, and quality. Forget the fermented vegetables. The thyroid and the adrenals need daily support from the healthy bacteria and nutrients found in cultured foods. Good gut bacteria can also help to naturally reduce stress levels that cause the body to age. Skimp on sleep. Stress and lack of sleep show up in the body as signs of age. Going to bed at 10 p.m. and dimming the lights two hours beforehand can make for a more restful night of sleep. More than a century ago, Nobel Prize winner Dr. Élie Metchnikoff observed that eating fermented foods could help us to live longer and live better. With the extensive research that supports The Body Ecology Diet, we've come to believe that aging isn't mandatory. To prevent the common experience of aging prematurely, it can be as simple as addressing our mineral deficits and reducing the stress of our modern lifestyle. Dec;38(12):3257-64. doi: 10.1002/eji.200838855. PubMed PMID: 19039772. Mackowiak PA. Recycling Metchnikoff: Probiotics, the Intestinal Microbiome and the Quest for Long Life. Frontiers in Public Health. 2013;1:52. doi:10.3389/fpubh.2013.00052. Yuan, Shenyuan; Fulvic Acid, 4 1988; in Application of Fulvic acid and its derivatives in the fields of agriculture and medicine; First Edition: June 1993. K. U. Schallreuter, M. A. E. L. Salem, S. Holtz, A. Panske. Basic evidence for epidermal H2O2/ONOO--mediated oxidation/nitration in segmental vitiligo is supported by repigmentation of skin and eyelashes after reduction of epidermal H2O2 with topical NB-UVB-activated pseudocatalase PC-KUS. The FASEB Journal, 2013; DOI: 10.1096/fj.12-226779. Han M-N, Lu J-M, Zhang G-Y, Yu J, Zhao R-H. Mechanistic Studies on the Use of Polygonum multiflorum for the Treatment of Hair Graying. BioMed Research International. 2015;2015:651048. doi:10.1155/2015/651048. Bing Han, Priya Sivaramakrishnan, Chih-Chun J. Lin, Isaiah A.A. Neve, Jingquan He, Li Wei Rachel Tay, Jessica N. Sowa, Antons Sizovs, Guangwei Du, Jin Wang, Christophe Herman, Meng C. Wang. Microbial Genetic Composition Tunes Host Longevity. Cell, 2017; 169 (7): 1249 DOI: 10.1016/j.cell.2017.05.036. "Grey hair linked with increased heart disease risk in men." European Society of Cardiology. Joanna Kaluza, Agneta Åkesson, and Alicja Wolk. Processed and Unprocessed Red Meat Consumption and Risk of Heart Failure: A Prospective Study of Men. Circ Heart Fail., June 12 2014 DOI: 10.1161/CIRCHEARTFAILURE.113.000921. Bryce A. Mander, Joseph R. Winer, Matthew P. Walker. 10.1016/j.neuron.2017.02.004. Neuron, April 2017 DOI: 10.1016/j.neuron.2017.02.004. Chung-Ping Liao, Reid C. Booker, Sean J. Morrison, Lu Q. Le. Identification of hair shaft progenitors that create a niche for hair pigmentation. Genes & Development, 2017; DOI: 10.1101/gad.298703.117.